I have USB printer connected to my Mac, but when I'm trying to print from Windows virtual machine nothing happens. Make sure that 'Add all Mac printers' option is enabled. Make sure that 'Synchronize default printer' option is disabled. 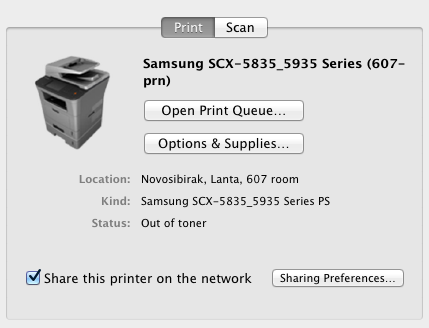 Open System Preferences on Mac OS X -> Print & Scan -> make sure that needed printer is in 'Idle' state and 'Share this printer on the network' option is enabled. Download and install Bonjour services for Windows in Windows virtual machine. Launch Bonjour Wizard - choose the printer you want to add to Windows. NOTE: If Bonjour doesn't have drivers for your printer model, you need to download driver manually. And click on 'Have a disk' option in Bonjour Wizard -> choose driver's *.inf file to install the driver. Open printer properties -> Advanced tab -> 'Driver:' section. Make sure you are able to set the driver from the printer you have. NOTE: By default Parallels Tools use universal HP Color Laserjet 2800 Series PS driver for working with most of devices. But using this universal driver disables most of advanced printer features. Once you checked printer driver, please go to General tab (in printer properties) and try to print test page.